Hey guys! I just wanted to post a quick haul of books I've gotten thus far since about January. This is just a tide-over till I can make a book review. Enjoy! 1. A Clockwork Orange by Anthony Burgess- I purchased this one yesterday from my campus bookstore. I've been wanting to read this book for a really long time, so I'm really excited to have it! 2. The Perks of Being a Wallflower by Stephen Chbosky- This was another campus bookstore purchase. Again, I've been eying this book for quite some time and I can't wait to read it. 2. The Iliad and The Odyssey by Homer- So, I think I'm the only person who didn't read The Odyssey in high school. Since being in college, I've heard this book mention sooo many times, so I decided I needed to get on it and read it. I found a bind-up of both the Iliad and The Odyssey on Thriftbooks for less than $5, so obviously I had to get it. 3. Dracula by Bram Stoker- I purchased this copy from my campus bookstore because it was the required text for my British Literature class. This is currently my third or so copy of this book. I've read this book before, and I really enjoyed it. I did forget some things, so re-reading it for class really made me remember how awesome a book this is. 1. 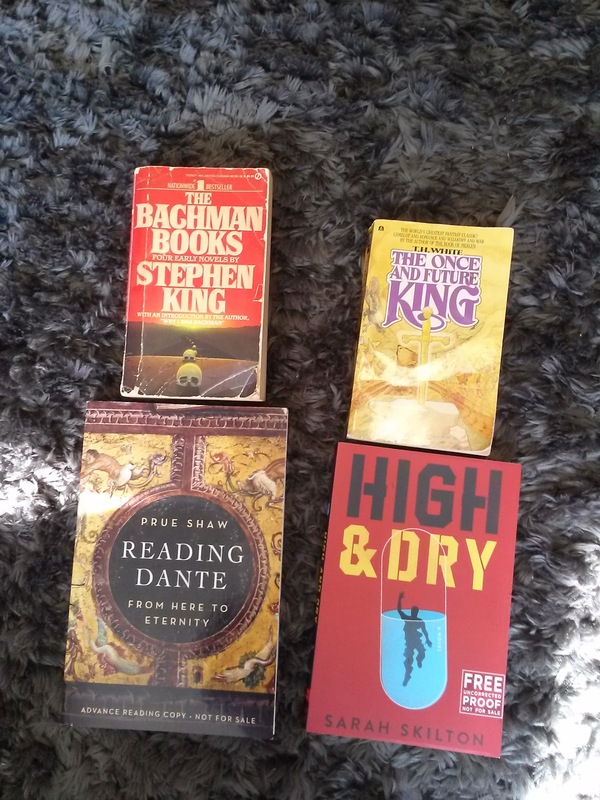 The Bachman Books by Stephen King- This is a collection of four of Stephen King's earlier books written under the name Richard Bachman. The collection includes Rage, (no longer in print) (this book was REALLY good! ), The Long Walk, Roadwork, and The Running Man. The only one that I've read is Rage, and it was really, really good. I think I bought this collection from Abe Books for maybe $5-ish? 2. The Once and Future King by T.H. White- I believe I purchased this one from Thriftbooks as well. I've always kind of loved the story of King Arthur, and this is one of the most famous tellings, so of course I had to get my hands on it. 3. Reading Dante: From Here to Eternity by Prue Shaw- I won an ARC version of this book from Goodreads. 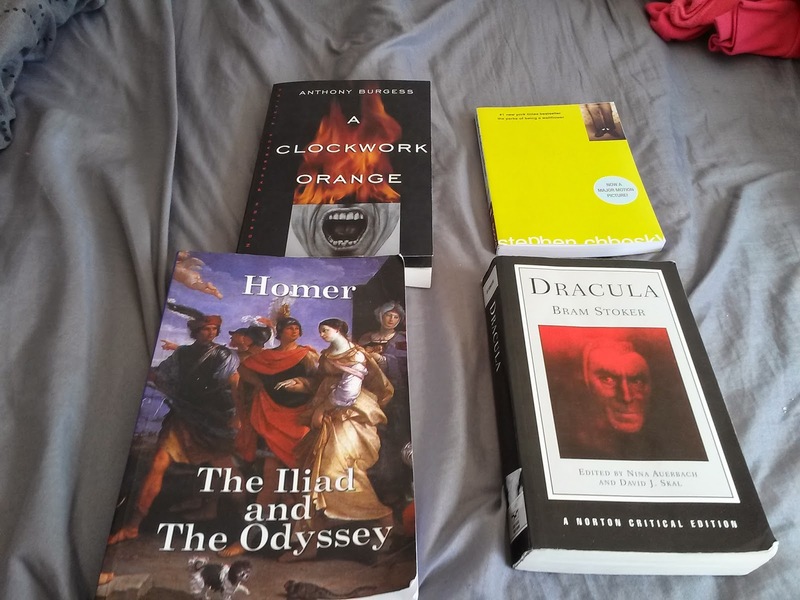 I haven't read any Dante (yet! ), but I'm really excited to have this book. It looks like it will be a great companion for when I get my hands on Dante's works. 4. High and Dry by Sarah Skilton- This is another ARC copy I received via Goodreads. I actually finished this book the night I got it. I really enjoyed it. It was short, and full of excitement. Alright, so here are all the books I've purchased/received these last couple of months. Again, I'll hopefully be posting a review in the next few days. Also, I think I might post a March TBR tomorrow perhaps. Have a wonderful book-filled weekend guys!